Three beach volleyball stars will be honored when the 27th Class is inducted into the California Beach Volleyball Hall of Fame this weekend. Jenny Johnson Jordan, Mike Lambert and Sean Scott are the newest members of the hallowed hall and will be introduced at the ceremony Saturday, Nov. 3. Happy Hour with the Legends kicks of the evening from 5-7 p.m. in the Hermosa Beach Museum followed by the ceremony in the adjacent Community Theatre. Along with the three new members, legendary player Steve Obradovich (Class of 2005) will be honored and introduced by Tim Hovland (Class of 2000). Awards will also be presented to this year’s top ranked CBVA players along with the CBVA Cal Cup Juniors State Champions. After being named the AVP Rookie of the Year in 2002, Johnson Jordan was named the Best Offensive Player in 2002 and 2004 and MVP in 2004. A winner of 10 professional beach titles worldwide, Johnson Jordan teamed with Annett (Buckner) Davis to finish fifth in the Sydney Olympic Games. 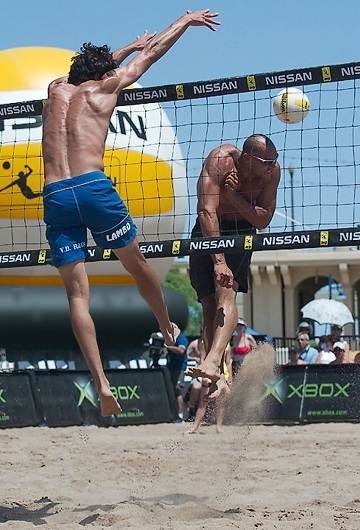 Johnson Jordan competed on the Pro 4’s, FIVB, WPVA, BVA and AVP Tours. 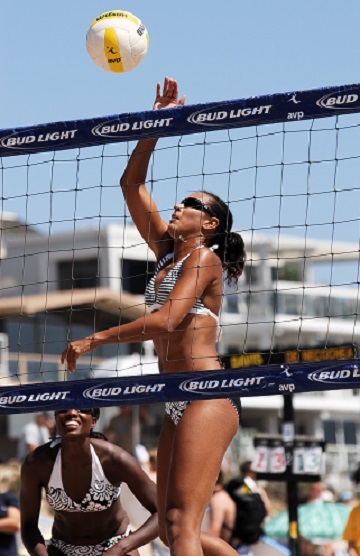 In 1997, she won the FIVB 4-Person World Beach Championship at UCLA. Two years later, she won a Silver medal at the FIVB World Championships. When asked what her favorite memory of her illustrious career is, Johnson Jordan replied “There are too many amazing memories to pick just one. Behind every special memory is an even more special story. “Placing second in the world championships in 1999 in Marseille during our first full year on the FIVB tour would be a good place to start. The process of qualifying and competing in the 2000 Sydney Olympic Games would be up there for sure. Although no longer competing, Johnson Jordan remains active in beach volleyball as an assistant coach for UCLA’s team which captured the 2018 Beach Volleyball National Championship this year. Johnson Jordan, daughter of Olympic Gold medalist Rafer Johnson, is married to former UCLA All-American wide receiver Kevin Jordan (class of ’95). The couple have two children, Jaylen and Kory. Known as “Lambo” or the “Hawaiian Curtain,” Mike Lambert was the AVP Rookie of the Year in 2002, and was named Best Offensive Player in 2002 and 2004. He was named MVP in 2004, the same year he and partner Karch Kiraly earned Team of the Year honors. Standing 6 feet, 6 inches, Lambert captured four first place finishes in 2004 including the Manhattan Beach Open. He recalls two of his favorite memories. Born in Kaneohe, Hawaii, Lambert graduated from Stanford where he was a three-time All-American and won the NCAA National Championship in 1997 alongside fellow AVP player Matt Fuerbringer. Lambert was also a member of the U.S. National Indoor Team competing in the 1996 and 2000 Olympics. Lambert stopped competing in 2008 and is living in Lucca, Italy with his wife Deborah and two children. The third inductee is Sean Scott, a Redondo Beach resident who grew up in Kailua, Hawaii. Scott earned at least one championship in 10 consecutive seasons (beginning in 2003) on the AVP Tour. 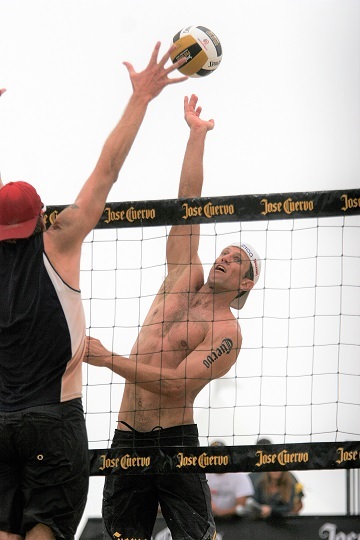 Voted AVP Rookie of the Year in 1999, Scott was named Most Improved Player in 2005. In 2011-12, he won 14 of the 19 domestic tournaments he competed in across four different tours. Although Scott has retired as a player, he remains active in beach volleyball. “I’ve shifted my time and energy to the administrative side of the sport as USAV’s Director of the Beach National Teams so while I haven’t been competing, I’m still very close and involved in the sport,” he said. Special Honoree Steve Obradovich had 11 Open wins including the 1976 Manhattan Beach Open with partner Chris Marlowe. Obradovich is pleased with this year’s inductees stating they are all well deserving of the honor. “Mike is a personal friend of mine. He’s a super guy and a great player,” Obradovich said. “We used to work out a lot in Laguna Beach. Mostly me shagging balls for Karch and Mike. I got a great workout. Tickets are $10 per person and available at cbva.com and at the door. Proceeds benefit the Hermosa Beach Historical Society CBVA Hall of Fame Exhibit.